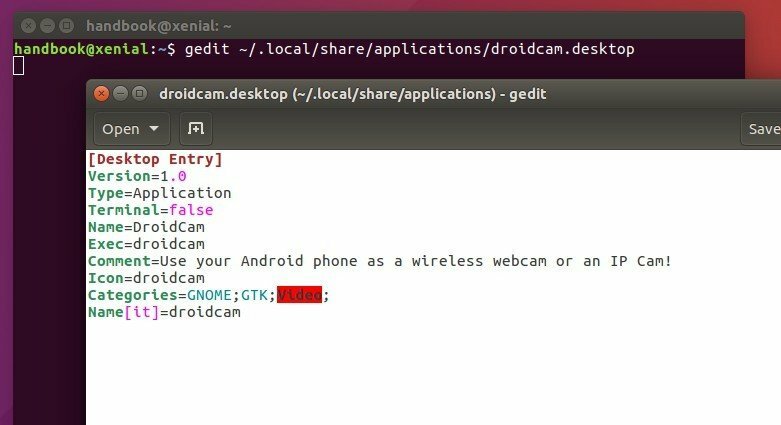 DroidCam is a simple tool that turns your Android device into a wireless webcam, letting you chat on Skype, Google+, and other programs. It also works with OBS/XSplit/etc for streaming to Twitch or YouTube. You can also use DroidCam as an IP webcam (or Surveillance Camera) via a Internet browser virtually on all networks. Use it as a simple pet cam, spy cam, or a security camera. Connect over WiFi or USB cable. Use other apps with DroidCam in background. 2. Extract and open the result folder in terminal by selecting “Open in Terminal” from its context menu. 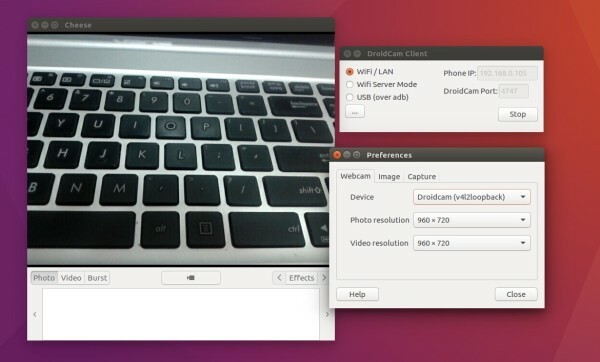 Once installed, you should be able to launch the client by running droidcam command in terminal. And paste below lines when the files opens and save it. For the shortcut icon file, grab one from the web, name droidcam (.png, or .svg), put it into .local/share/icons folder. Finally launch the client and start DroidCam in Android, select connection mode, type in ip, port, and click connect. Open up a V4L2 compatible program (VLC player, Skype, Cheese, etc) and you should see DroidCam listed as a video device. then change the value of width and height. Recommended resolutions are 320×240, 480×360, 640×480, 960×720 or 1280×720. I do actually see a big issue with this..
Why not just do the chatting through hangouts on the phone? It’s all sync’s with the desktop anyway so doing it this way is just extra work for nothing. I have a little issue with OBS, I can see the camera imput as V4L2 and work so good, but I cant get audio from the cellphone, that could be posssible? I was reading about and V4L2 don’t have a audio layer, is only video, the DroidCam windows client run a virtual audio card and is listed in OBS. I solve this problem in linux just running an audio server from my android (like LANmic), and getting the streaming using VLC and recording the system output in OBS. maybe is a not elegant solution but work to me. of course that method have hi latency even using a low buffer…. I need to (select connection mode, type in ip, port, and click connect.) using terminal .. how can i do that ?? Works on ubuntu 16.10! Thank you! Hi, I’m trying to install DroidCam 64bit on Ubuntu 16.04. When I install I got (insmod: ERROR: could not insert module /lib/modules/4.4.0-62-generic/kernel/drivers/media/video/v4l2loopback-dc.ko: Required key not available)error. Is this a kernel problem? What do I do? Thanks.